The aquarium is still looking OK. The water is very clear and there are no algae on the glass whatsoever, but the brown algae still spread on the seaweeds, even with frequent skimming and the use of Rowaphos. There is some snail mortality, partly because of the Corkwing (who is not that keen on frozen food). I have added some Dulse Palmaria palmata (front left) and also some Chrysymenia wrightii (right, back), which I had growing in the aquarium succesfully before. This is an invasive species from Japan, first spotted in the Mediterranean three decades ago, spotted more recently in Galicia and now also appearing in the British Isles. 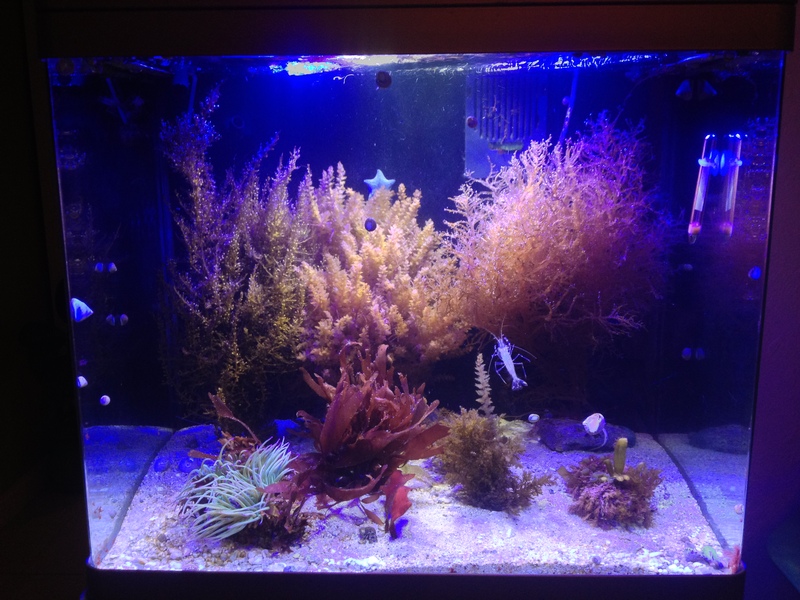 (So the ‘back row’ of the tank consists entirely of invasive species, Wireweed, Harpoon weed and C. wrightii). In the Mediterranean it occurs in shallow water whereas in the Atlantic it seems to be a deeper water species (see here). It occasionally washes up in Flushing, see the pictures below of a very large plant I found last week (wellie top left yor scale). I hope to go snorkeling some time soon to try to see how much of it is there. 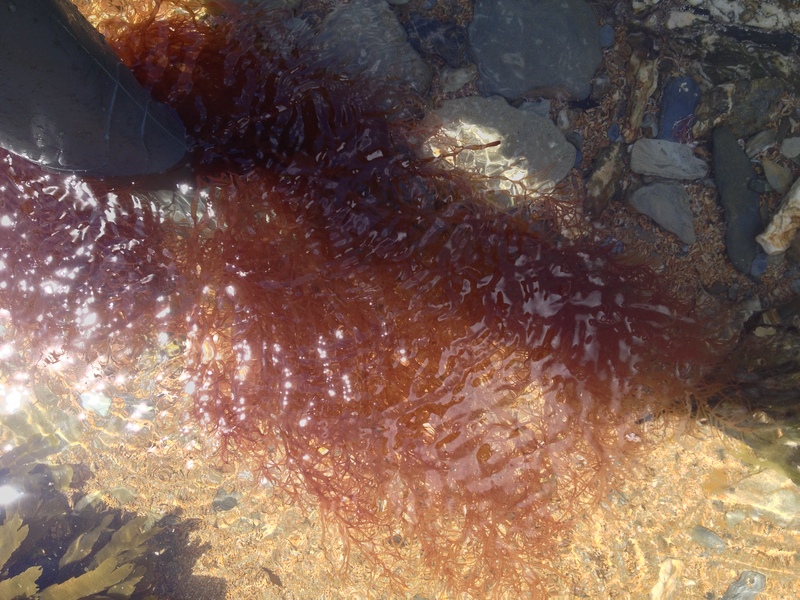 This entry was tagged Chrysymenia wrightii, dulse, invasive species, Palmaria palmata. Bookmark the permalink. Hallo, I admire Your aquariums, I am willing to do one (300 liters) just like Yours. I live in Italy and I have long experience with fresh water aquariums. Do you have any suggestion about the seaweeds and macro-algae that I can find into the Mediterranean sea ? How should I fertilize the sea-weeds ? Is it like normal aquatic plants ? CO2 ? What temperature do you keep your aquariums ? What chemical values ? The area where you collect the weeds is Cornwall, right ? I do not know anything about Mediterranean aquariums! As the tidal differences are much smaller, I guess the rock pool creatures experience a more constant environment and might be less hardy. I guess you can find out what the water temperatures are around the year near you, but the aquarium temperature can probably be a bit higher. CO2: hmmmm I am not a big fan personally of that in freshwater aquariums. Marine tanks work very differently: the CO2 will dissolve in the water and make the water more acidic (bad for shells). 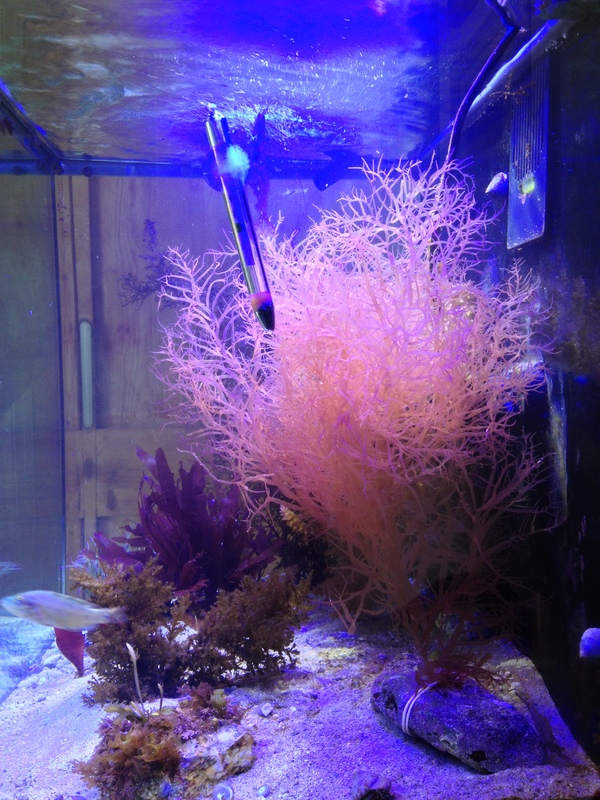 I don’t think CO2 is very limiting for seaweeds; having the right light is more important, and also some nutrients in the water (but like fresh water aquariums, not too much of that otherwise nuisance algae start to grow). You can try out which seaweeds work by placing small pieces of them in the tank (not large in case they die off, this can mean a lot of rotting debris). The best strategy is to be patient and wait for seaweeds to grow from the rocks. Hope this is of help! Thank you for the answer, this very time of the year I started having big pleasure in realizing aquariums from the environment around me. I did a 350 l Brackish aquarium l and a “Nostrano” which I don’t know how to translate in English (literally a colloquial expression that means something like “OURS”) it is made with the natural elements from the rivers (in particular the Po) around my town Turin (Italy). I have collected a large amount of native plants and after enormous initial problems the tank has finally started. – The third dream to realize is a Marine aquarium from the closest sea to me which is about 300 km from my town. Here one of the immediate problems to solve after the collection is the transport. Where should I store them ? How long algae can stay in a plastic bag or other better container ? Here the temperature should be around 16-18 Celsius degrees, what about in your area ? I’d like to grow Macro-algae and Posidonia or whatever I find there, for this reason I wanted to know the average temperature of your tanks, what did you use as substratum (like sand, gravel or fertilizer, either liquid or some kind of “manure” on the bottom). Light: what kind did you choose ? The power in watt/liter or gallon and how many kelvin ? I know very well that it doesn’t work like Freshwater plant aquariums and no equal comparison can be made but indeed some freshwater plants are TERRIBLY difficult (just survive) in respect of attentions, environment and growing requests. I don’t expect to set up an aquarium to grow a Macro-algae or a Fanerogama like eating a piece of cake ! Hahaha ! Sorry for the many questions but the eventuality to fail for is high and the more information I collect from an experienced person like you will increase my chances to success. sorry for the late reply. One thing I really like about my aquarium is that I combine it with my other hobbies rock pooling, snorkeling and diving. This will be much more difficult for you; it will also be much more difficult to free some animals before going on a a holiday etc. I know many people in Holland collect in Bretagne, and you can use cooling elements etc to transport stuff in the car. The Med is a bit different with little tidal variation and I imagine conditions in shallow waters get less extreme (temperature, salinity, oxygen) than here, so animals might be a bit more sensitive. An eelgrass aquarium would be great, but remember this is a vulnerable habitat, so I would only collect washed up plants and not rip them out. You would need a thicker layer of sand if you have rooting eelgrass. They might benefit from some clay balls as used in fresh water aquariums, but I do not know that for sure. The light: I would recommend going for LEDs (more economical and pretty) especially with a dimmer so you can experiment with light levels. 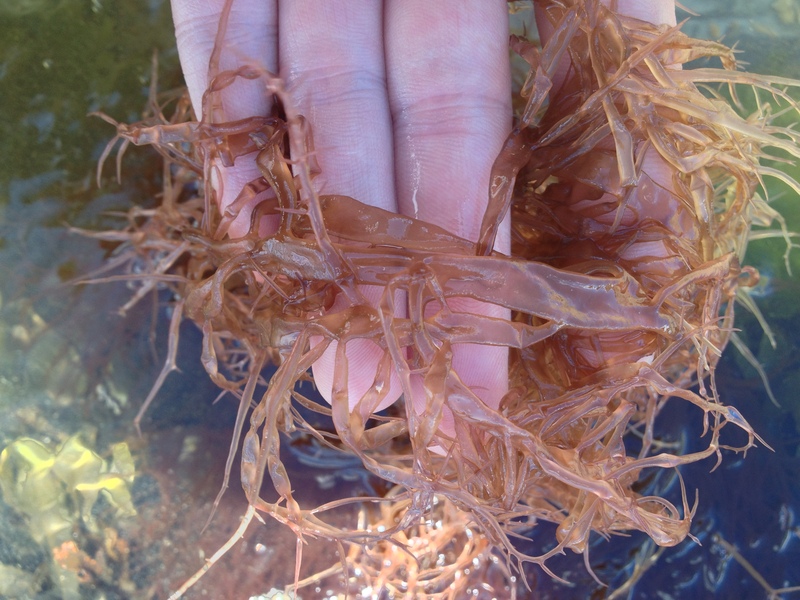 Remember that seaweeds grow and die off, they are much less stable than freshwater plants. I think the key is to not overstock your tank, and get the biggest tank you can afford!